After 5 years on the Hudson River, the Macy's 4th of July Fireworks Spectacular returns to the East River, so it's time to reexamine and improve some dusty old viewing strategies. 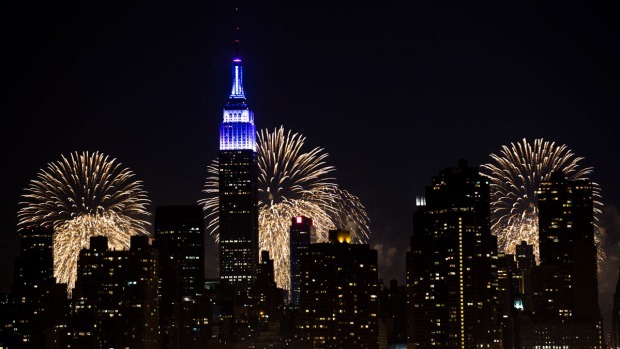 For those who want to watch from the comfort of home, the fireworks spectacular will be broadcast on NBC 4 New York at 8 p.m.
NBC New York's Rob Schmitt sits down with Amy Kule, the executive producer of the Macy's 4th of July Fireworks Spectacular, to discuss this year's event. You'll find excellent views at Brooklyn Bridge Park, the South Street Seaport and Brooklyn Heights Promenade. For $150 per person, customers will be seated at a table with a buffet and soft drinks from 6:30 p.m. to 11:00 p.m. A tent will be set up on the pier by the shop giving the audience a front-row seat to the firework display. The restaurant in Williamsburg has a greenhouse-like rooftop that has a breathtaking view of the Manhattan skyline. For the 4th of July, the restaurant will seat customers on a first come, first serve basis. Tickets are still on sale for the Z Hotel Roof Top Red White and View. Prices are $166.03 for adults and $66.56 for kids. The swank hotel will have a picnic starting at 3:00 p.m. and rooftop access for the show. The Mondrian Hotel still has tickets on sale for its 4th of July party at Sonny’s Soda Shoppe. For $175 per person, guests can view the East River show from a private rooftop. Guest arrive between 4 and 6 p.m. will enjoy complimentary Peroni, pizzas and gelato. Because it’s first come, first serve with no cover, lines can get long to get into this rooftop bar, but $5 drink specials from 2 p.m. to 7 p.m. are well worth it. Amy Kule, executive producer of the Macy's 4th of July fireworks, sits down with Stacey Bell to talk about the plan for this year's show. The New York Water Taxi has two special packages for Independence Day. The first package for $225 departs from Pier 45, Hudson River Park and includes hors d’oeuvres, buffet, desserts, soft drinks and a cash bar. The second package on the Zephyr costs $325, departs from Pier 25 with a buffet and cash bar. Both packages last three and a half hours and board at 7:15 p.m..
For $399.90 per person, customers can enjoy an up-close view of the firework spectacular from 6:00 p.m. to 11:00 p.m. Guests will enjoy a dinner buffet, DJ’s for the dance floor and probably most importantly -- a premium open bar.